In late Spring, turf grass, depending on the type, will either be coming into its prime, or on its way to decline. Each type has a preferred growing season. In either case, these simple guidelines will help ensure the best chance of looking it’s best this summer. Become familiar with the ideal mowing height for your type of lawn and keep it cut to the appropriate level. Avoid cutting off any more than 1/3 of the grass blade each time you mow. More aggressive mowing can add stress to the plant, contribute to turf disease and increase thatch buildup. All grass types do best when the amount of water applied in one week is between 1 and 1½ inches. In the absence of sufficient rainfall, you’ll need to irrigate. Best long-term results are achieved when water is applied all at once or no more than twice each week. In this way, deep soaking encourages grass roots to grow deeper, making them more drought tolerant. Grass that is watered more often keeps grass roots from having to grow deeply to find moisture. Shallow rooted turf does not hold up as well to hot dry weather and will decline more quickly in the absence of water. Over watering is also a major factor of turf disease. An easy way to monitor the amount of water being delivered by your irrigation system is to set out several tuna cans and see how long it takes to fill. When the can is full, one inch of water has been applied to that area. However, be sure to note that not all areas of your lawn will be watered at the same rate, so conduct this test through all your zones. Water your lawn between 10 p.m. and complete by 10 a.m. This will coincide with the time that dew is present on your grass. You do not want to prolong the period of time that grass stays wet, due to the increased risk of disease. Turf grass should be fertilized only during the period of active growth. Although fertilization can really green up your lawn and stimulate new growth, too much is not good. When fertilizing grass, many turf diseases are promoted by excess nitrogen, the primary chemical in lawn fertilizers combined with fertilizing too late in the season. For cool season grasses, it’s either too late or becoming too late to fertilize from the end of April until fall. 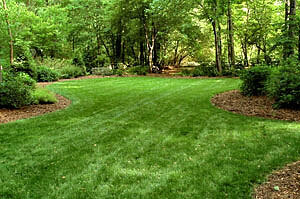 For warm season grasses, mid to late Spring is the first time of the year when you can effectively start fertilizing. Never apply more fertilizer than the instructions call for. Mulching grass clippings back into the lawn is known as grass cycling. Most modern mowers have this feature. Rather than discharging the cuttings into a bag, the clippings are chopped again before falling harmlessly into your lawn. The small clippings left behind are virtually invisible, but do promote the long-term health of your soil by adding organic material. Grass cycling can return as much as 30% of the nitrogen required by grasses for proper nutrition. The key is to not cut more than 1/3 of the grass blade’s total height each time you mow. Otherwise, you can increase the chances of thatch buildup and cause undo stress on your lawn as well. Many lawns start to decline due to excess shade. No grass is happiest growing in shade, but some are more tolerant than others. If turf decline is apparent in your lawn due to shade, consider limbing up overhanging tree branches as much as possible. This allows more light to the surface of the lawn, and can make a big difference. Another trick for cool season grasses in shady environments is to cut the grass at the highest setting on your mower. This increases the amount of blade surface available to absorb sunlight and photosynthesize. For warm season lawns, dethatching and aeration may be in order. Thatch is the buildup above the soil of grass stems, runners and roots and breaks down more slowly. Excess thatch layers are unhealthy to a thriving lawn, and can contribute to drought problems. Dethatching removes this unwanted layer and aerating stimulates thatch decomposition. Aeration has the added benefit of relieving soil compaction and improves air circulation and water availability in the soil.